RI Mayor Mike Thoms in front of the future NFL museum, at the corner of 18th Avenue and 9th Street. 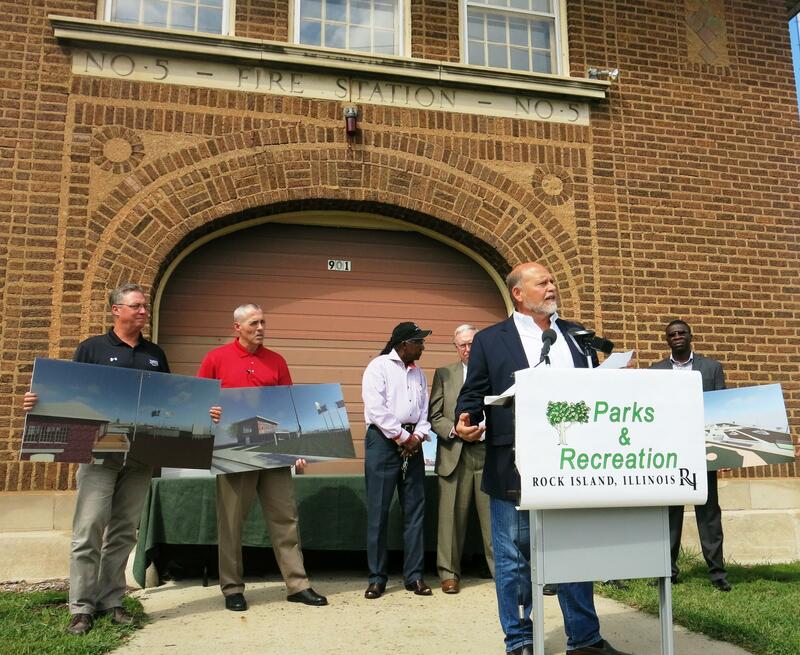 Ambitious plans are in the works for Douglas Park in Rock Island. Tuesday city officials and members of the Friends of Douglas Park announced they want to turn the 102 year old firehouse into a museum. The museum, on the corner of 18th Avenue and 9th Street. would commemorate the first NFL game, played in Douglas Park in 1920. Mayor Mike Thoms says fixing up the park, and opening the museum, would help rejuvenate this part of west Rock Island. "We're right off of 92 here, 11th Street down here is one of the major thoroughfares, and this is a gateway to the west side of the city. And we want to make sure it's presentable and has a lot of interesting things to do." The fundraising chair for the project, Steve Grubbs, says in addition to the exhibits inside the firehouse, there would be exhibits outside, about the first NFL game. "When the Packers played here, when the Bears played here - we'll commemorate those with life-size images. People can then stop, pay a small fee, and enjoy the museum or they can just go out here and get their photos taken with the giants of the game." And he believes this would bring in a lot of visitors, to Rock Island and the Quad Cities, and give a boost to the economy. Illinois and Iowa also played each other for the first time in the park in 1899. The Friends of Douglas Park has been working with the city to fix it up, and has raised more then 120,000 dollars, to renovate the fields and build a playground.